Be the first to share your favorite memory, photo or story of Virginia. This memorial page is dedicated for family, friends and future generations to celebrate the life of their loved one. Virginia Cox Baker , 91 of Butler, Missouri passed April 3, 2018, at Adrian Manor Nursing Home in Adrian, Missouri. Funeral services will be held 2:00 pm Monday, April 9, 2018 at Mullinax Funeral Home, Butler (660-679-0009). A visitation will be held Monday from 1:00 pm to 2:00 pm prior to the service, also at the funeral home. Burial will follow services in Double Branch Cemetery. Memorial contributions are suggested, in lieu of flowers, to the Fulton Street Church of Christ or the Alzheimer’s Association. Messages of condolence may be left for the family at www.mullinaxfuneralhome.com. Virginia, the daughter of Richard Park Bland Cox and Pearl Estella Wade Cox, was born on October 26, 1926, in rural Bates County, Missouri. She was baptized into Christ in her early teens and remained a faithful Christian all of her life, attending the Fulton Street Church of Christ as long as she was able. She graduated from Butler High School in May, 1943. During WWII, the Kansas City Secretarial School came to Butler to recruit young women to attend their school and then to place them in jobs related to the war effort. Upon graduation from secretarial school, Virginia worked in a department that issued rationing stamps. After the war, she returned to Butler and worked for Mr. Denton in his abstracting business until her marriage to Everett Lee Baker in August, 1945. 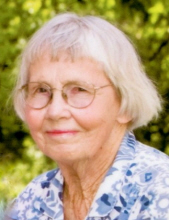 Virginia and Everett Lee made their home in the Double Branch area, where she enjoyed farming and tending livestock on the land they named Blue Grass Valley Farm. They had a dairy of registered Guernsey cows, keeping production records on each one. They enjoyed showing their cattle at the Ozark State Fair in Springfield and at the Missouri State Fair in Sedalia. When retired from dairying, they bought Angus cows and developed that herd into a top- producing one. Shortly thereafter, they entered into the registered Nubian goat business. Virginia took very good care of her goats and loved to show them at the two state fairs. She also entered her goats in some of the annual National Goat Shows, winning several Grand Championships. Her herd was very well known by goat breeders all over the United States. Virginia also loved flower gardening and making floral arrangements to show at the Bates County Fair. Each year, she liked to order the newest varieties in daylilies, her favorite flower. Virginia was preceded in death by her parents, an infant daughter, husband Everett Lee, brother David Cox, and sister Sara Burch. She is survived by sisters Bettie Scifers and Joan Ghere, sister-in-law Beverly Cox, brother-in law Leland Burch, all of Butler, Missouri, and several nieces and nephews. To send flowers or a remembrance gift to the family of Virginia Cox Baker, please visit our Tribute Store. Mullinax Funeral Home & Cremation Services, Inc.
"Email Address" would like to share the life celebration of Virginia Cox Baker. Click on the "link" to go to share a favorite memory or leave a condolence message for the family.